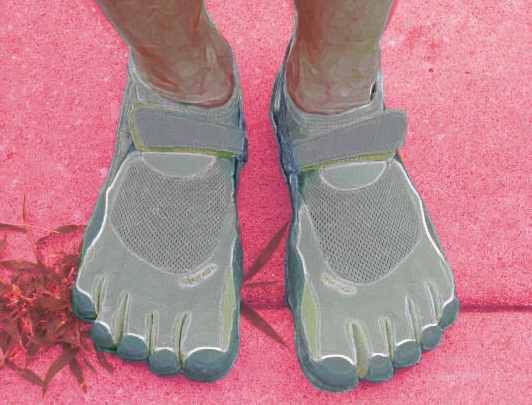 Our Trail Meister Ben Holmes has some thoughts on barefoot running…. Everybody is talking about the book, “Born to Run.” I found the book to be an interesting read, although it wandered and switched-back like a Wyco trail, at times. It was fairly complimentary to trailrunning and ultrarunning in general, while not embellishing upon the characters (too much). And, it brought some names out of the woodwork that aren’t normally mentioned in running circles, because they shun the talk show circuit and aren’t self-PR promoters. On to the subject at hand: Barefoot Running. Barefoot running can be used as a tool for gaining better running form, I’ll give it that. But barefooting it in the “real world,” whether on roads or trails, has it’s hazards. Even the Tarahumara tribesmen in the book, “Born to Run” wear hand-made Huaraches, constructed of car tire treads. While not “cushy,” they still offer a large (1/2″ thick rubber) degree of protection from rocks and “sharps” to the bottoms of the feet. Barefoot Ted, a character in the book, sustained somewhat “shredded” feet after 50-miles (on desert trails), while wearing his Vibram FiveFingers. And we’ve had local runners’ break their little toes while wearing Vibram 5Fs on our rocky trails. like ordinary dirt & gravel roads.